Cars are heavy machinery, complex instruments and very dangerous. Yet almost anyone over 16 can drive them, and keep driving them for long past their best-by date. My mom drove until she was 92 and they finally took her licence away; there are a lot of people who shouldn't be on the road. Yet when pedestrians and cyclists get maimed or killed, it is often called an "accident", even though there is really no such thing. He was parking the car to drop his child off at school and he pressed in the gas instead of the brake. He thought he was slowing down but he pushed the gas and jumped the curb. Here is a driver caught on video slamming into kids on a sidewalk. 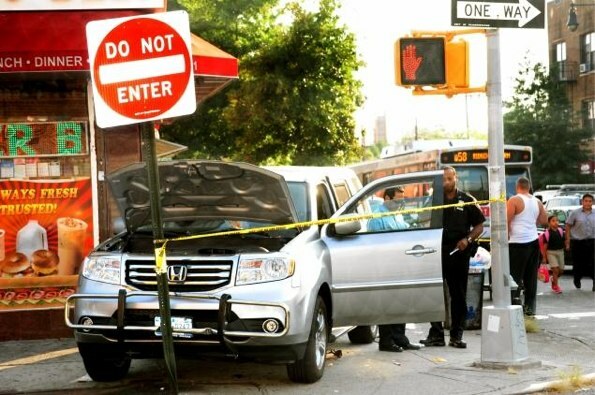 Despite clear evidence of negligence, it appears that neither NYPD nor District Attorney Richard Brown considers this a crime — and possibly not a traffic violation. As reader BornAgainBicyclist pointed out today, that the victims suffered mere “non life-threatening” injuries seems to have absolved the motorist, at least as far as authorities and the media are concerned. No reports that we’ve seen have questioned how this driver would face no repercussions for mounting a sidewalk and mowing down five children. As Aaron Naparstek points out in a tweet, the cops could have impounded the car, investigated phone records and looked into the black box that is in most newer cars. As a long time driver, I don't know how any reasonably competent driver could mix up the pedals like this unless they were seriously distracted. They could charge the driver for illegally modifying the safety devices on the car. Instead, it is all just an accident. ..and jump out of the way when a car is driving on the sidewalk. None of the kids were wearing headphones, but once again, it is assumed that it is the pedestrian's responsibility to get out of the way or they are part of the cause of the "accident." It's time to stop blaming the victims. It is time to start charging drivers and stop blaming victims, and take back the streets.